When 15 year old Gabriella was a baby, her mother, Isobel, made the decision not to give her the MMR vaccination. There had been a great deal of adverse publicity about the vaccination and Isobel had decided it was not worth the risk to her daughter and later on for her two sons that followed. It was something that she did not give much thought to in the subsequent years. That is until the summer they go away on holiday to France with a group of friends and Gabriella contracts measles. This would be bad enough for the fifteen year old in itself, but even worse, she passes it on to Ben and Maggie’s one year old daughter, Iris, who is too young to have had the vaccination. It would probably all be forgotten in time apart from the fact that there are complications that cause Iris to become totally deaf in both ears. This leads to a great deal of upset, recrimination and blame all directed at Isobel and her decision not to have the children vaccinated. What unfolds, is a riveting tale of how the couples deal with what has happened. Not only does it lead to a rift between the two couples but also between the couples themselves; Maggie and Ben have different ways of dealing with their daughter’s deafness, and Isobel’s husband Eric seems as much intent on blaming her as everyone else. Living With It is a fascinating and thought-provoking read about a still quite topical subject. I remember when my daughters were young grappling with the decision whether to vaccinate or not. I am sure that many readers will be reminded of such difficult dilemmas themselves. It also makes one wonder whose side one would be on and how each and every one of us would react in similar circumstances. Lizzie Enfield is a fantastic writer who has created very real characters and a situation that many readers can relate to. 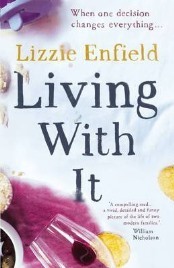 I would heartily recommend reading Living With It and I will definitely be looking out for more books from Lizzie. Thanks to the publisher for providing the review copy. No Comments on "Living With It"